The RENZO PIANO FOUNDATION has selected the winner of the first edition prize reserved for Italian Architects under 40. The studio IOTTI + PAVARANI ARCHITETTI in Reggio Emilia was awarded the first prize for their project Domus Technica. The award, promoted by the Italian Association of Architecture and Criticism directed by Luigi Prestinenza Puglisi, received more than seventy entries screened by a single juror: Renzo Piano. The Renzo Piano Foundation has selected the project Domus Technica: the new Immmergas Center for Advanced Training by Iotti + Pavarani Architetti as the winner of the first edition of the prize, promoted by the Italian Association of Architecture and Criticism (AIAC) and chaired by Luigi Prestinenza Puglisi, which is awarded to up-and-coming architects under 40. 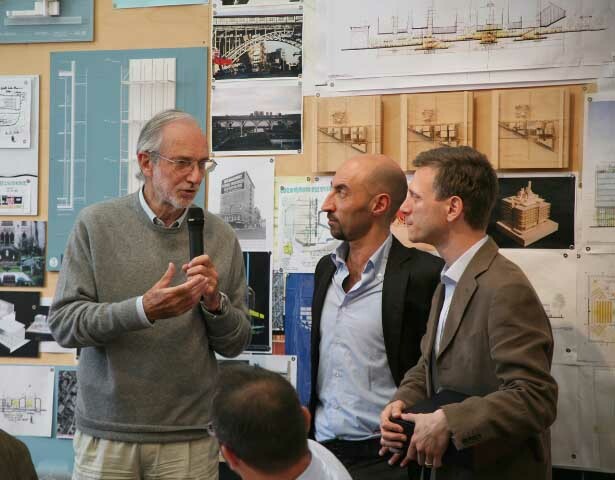 Approximately seventy applications from all over Italy were examined, and evaluated by a single judge, who is one of the greatest professionals in the field: Renzo Piano. At the awards ceremony, that took place in Genova at the Foundation’s headquarters, Renzo Piano stated, “In order to understand how the idea for the award was conceived it is necessary to step back a few months, when Luigi Prestinenza Puglisi came to find me in my studio in Paris. We began talking; I have always appreciated the free spirited personality of Luigi, and his cheerful informality. For many years we have shared an admiration for young people, especially those that are architects. Young and architects, a winning combination. It was because of this that we thought about establishing a prize intended for Italian architects under 40 that have realized a project”. Luigi Prestinenza Puglisi commented on the unique nature of the prize, in both the initial selection of the twelve best projects (by a jury of young people chosen from those initially arrived) and later in the selection of the winner (by Renzo Piano), based on their ability to focus on the role of the younger generations in the profession, “A prize awarded directly by the best Italian designer is a source of pride and satisfaction. I say satisfaction because the award was given to the architects by a person and not a committee; pride because it was bestowed to them by a renowned architect which can be helpful in the endless vicissitudes of the profession”. Domus Technica, the new Immmergas Center for Advanced Training for the Immergas Company was completed in 2010 in the city of Brescello (Reggio Emilia). Immergas has extended its research and production fields to new generation technologies in regards to the exploitation of renewable resources (solar thermal, photovoltaic, and heat pumps). The project was conceived as a “laboratory” containing teaching rooms and showrooms where technicians and professionals are trained and updated in both the installation and implementation of these technologies as well as emerging processes related to this type of research. The building is divided into two levels. The main one, on the ground floor, contains a spacious atrium that opens to the surrounding landscape, four showrooms (dedicated to high power, new technologies, solar power and photovoltaic systems) and a central technological showroom (space dedicated to ‘energy storage’, set in the centre as the heart of the machine “Domus Technica”). On the top level, a meeting hall opens towards a terrace; the “artificial landscape” constructed with alternating paved surfaces, green surfaces and tilted glazed surfaces that support the solar and photovoltaic panels. The upper body of the building sits on a “heavy base” that roots it to the ground. It performs like a translucent compact volume inspired by the industrial vocations of the region. At the same time it tries to renew the area’s appearance by creating a more refined an evocative image of what is considered a “technical place”. The effects of the facade, created by light and weather conditions based on the time of day or the seasons, change the character of the Uglass finish which appears to have a transparent and diaphanous nature at times or viceversa, a solid and monochromatic nature at others. In the evenings, a lighting system is powered entirely by the energy produced from the photovoltaic panels and transforms the building into a body of light. The building, designed as a “Class A” certified structure, is self-sufficient. The equipment installed in the four ground floor showrooms produce, using various technologies, primary cold and hot fluids that have been completely recovered, stored and reutilized to meet the energy requirements of the building as well as those of the pre-existing office structure. On May 24, 2011 Domus Technica has already been awarded the National Prize for Architecture ANCE IN/ARCH IV edition as a work designed by young architects (under 40). A recognition that, in the long tradition of IN/ARCH Prizes which was launched in 1962, promotes “the value of the constructed structure as the convergence of multiple factors: from the customer to the entrepreneur, the component manufacturer and finally the designer”. The practice of Iotti + Pavarani Architetti was founded in 2001 from the professional partnership of Paolo Iotti and Marco Pavarani. It has had a high success rate in architectural competitions, especially those that deal with the confrontation between architecture and landscape. From the year 2000 to the present the firm’s efforts have been rewarded with eleven first prizes, three second prizes, a third prize, and two honorable mentions. The majority of the winning projects have already been built, whilst the remaining ones are in diverse phases of the design process. Amongst these projects are the masterplan for a residential and service complex of 20 hectares in Riga (Latvia), the masterplan for an area of 60 hectares in Nuremberg (Germany), the plan for the residential neighborhood in Ferrara (Italy), and the waterfront project of Selinunte (Italy). In 2004 they won the first prize in a Europe-wide two phase competition for the new stadium in Siena; a project which was able to merge the infrastructure of the sport’s complex with the picturesque and delicate landscape of the Tuscan hills. The project was also recently awarded the MIPIM Architectural Review Future Projects Award 2011, in their “Retail and Leisure” category. In 2003 the studio received an honorable mention for their Peace and Freedom Monument in Correggio, Italy as part of the prize Medaglia d’Oro all’Architettura Italiana (Golden Medal for Italian Architecture) by the Triennale di Milano. In 2006 they were invited to participate in the 10. Architecture Biennale in Venice in the La città Nuova. Italia-y-2026 exhibition curated by Franco Purini for the Italian Pavilion. In 2011 they were awarded the National Prize in Architecture ANCE IN/ARCH IV edition and the RENZO PIANO FOUNDATION AWARD for architects under 40 for their Domus Technica Immergas project.